The Hub is our unique convergence platform, capable of consolidating your raw data to provide a single customer view. The Hub will maximize the potential profitability of every one of your players, across every aspect of your business. Compile your raw data streams in one place, from gameplay & revenue to marketing campaigns & social media. Track player growth across multiple platforms and convert low value customers from one area of your business, into high value customers in another. Deliver automated targeted messages, promotions & gameplay configurations to nurture valuable customers and drive revenue in real-time. Send us your raw data, in any format and The Hub will merge information from social & real-money games, marketing campaigns, purchases & social engagement to create meaningful reports and deliver a valuable single player view. 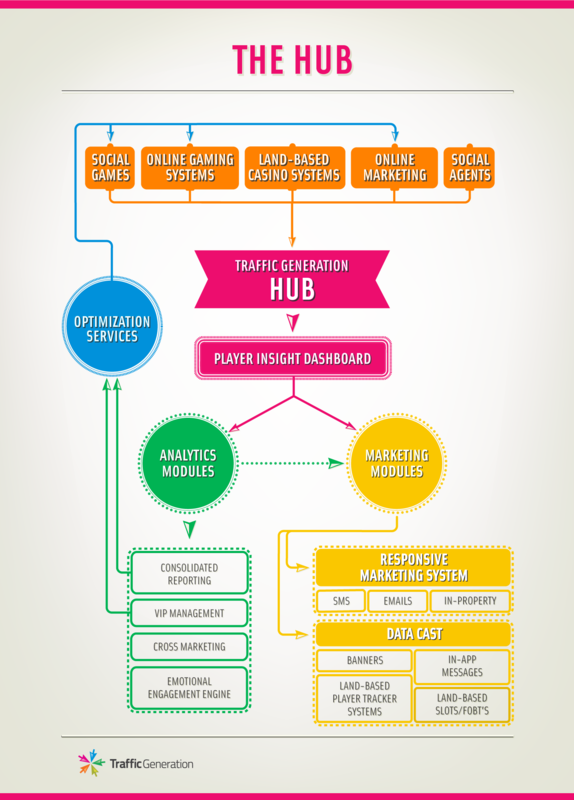 The Hub’s ability to aggregate player behavior and voices in real-time enables you to take relevant actions, such as targeted communication, promotions and game optimization, all focused on increasing engagement, retention & monetization. The Hub is based upon an extremely scalable & adaptive architecture, comprised of a powerful NoSQL core and flexible RDBMS layer. The resulting platform provides an intuitive user experience, allowing you to easily access cross-marketing and customer insight data at an unprecedented level of detail. Utilizing a range of artificial intelligence techniques such as machine learning and data mining, The Hub is able to build accurate predictive and propensity models that adapt and refine themselves as time goes on, allowing you to track your player-base with increased accuracy. The Hub is based in the Cloud and uses secure data partitions to ensure scalability for large quantities of data, as well as security for your sensitive information.